Do you hear that music playing in the background? Yup, your ears aren't playing a trick on ya. It's Duel of the Fates. And that means you're Darth Maul, and it's time to get out and take care of some pesky Jedi. You did remember to pack your lightsaber, right? Being a Sith apprentice carrys some baggage in and of itself, but there's no way you'd forget to pack your trusty weapon. As ancient as the order of the Sith itself, a red lightsaber is a pretty big deal to the dark lords, and that's why, as Darth Maul, you have constructed one of the coolest lightsabers ever to have been seen. The dual-bladed saberstaff! If you're not the real Maul, and are just going with a costume for Halloween, the Star Wars con, or the twentieth anniversary of The Phantom Menace, that's still cool with us. 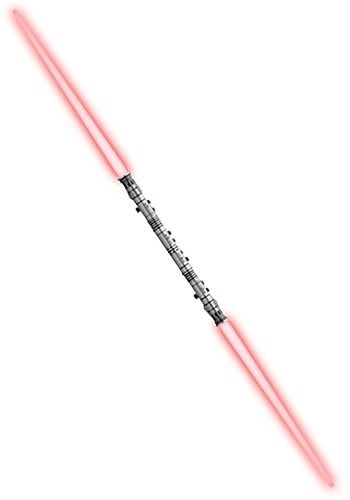 And that's why we have this authentic Double-Blade Darth Maul lightsaber for sale. It will complete your villainous Star Wars costume with the touch you need to be truly devious. (Well, face-paint helps too, but that's available on another product page.) This Star Wars accessory is officially licensed, and ready to help you battle Jedi (or even flip sides and fight for the light side of the force!). So when the music starts to play for you, just join the dark forces with a Darth Maul costume and this double-blade weapon. Because when you take up the role of a Sith assassin, you won't be able to perform high priority missions without one. And one more pro-tip: enjoy your rage, it is the source of your power. My son had this lightsaber before. It broke, but it is still decent for the price!